History: 70 year old male with acute onset right hemiparesis and slurred speech. 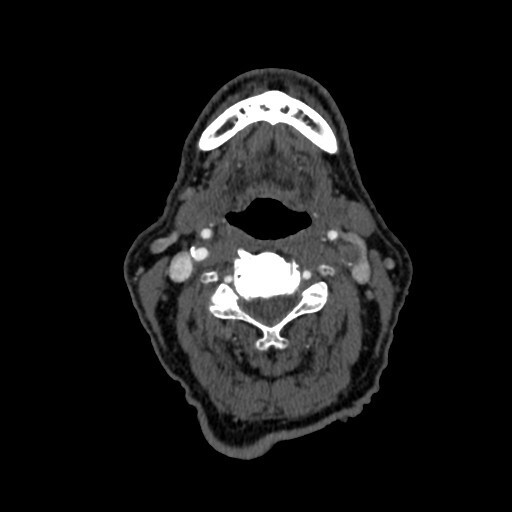 Single axial CT angiogram of the neck shows lack of opacification of the left internal carotid artery, suggesting complete occlusion. Note also the calcified plaque within the right internal carotid artery. On this CT angiogram of the neck, the left internal carotid artery appears completely occluded, however, technically complete arterial occlusion can only be diagnosed on conventional catheter angiogram by ruling out a possible “string sign.” This patient went on to have a left middle cerebral artery stroke.